Gentle lullabies weave a theme of appreciation and respect for the diversity of life on earth including animals, plants and people from many lands. Multicultural Songs for Quiet Times. These gentle songs weave a theme of appreciation and respect for the diversity of life on earth including animals, plants and people from many lands. This theme of diversity is reflected in the variety of musical styles; melodies from serene to tenderly spirited created a loving environment in which children can sing together, play quietly or peacefully drift off to sleep. 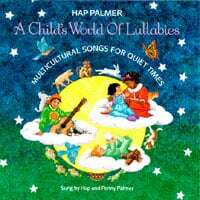 Hap's original compositions Counting Miracles, Spinning on the Same Ball, A New World to Explore, Old Rocking Chair and Sleep On (based on a melody by Brahms) are combined with lullabies from many lands: Sleep My Baby (Nigeria), A La Nanita Nana (Spain), The Bambo Flute (China), Chippewa Lullaby (Native American), Hush Little Baby (England/Appalachia), All Night All Day (African American Spiritual) and Dormite Niñito (El Salvador). The soothing voices and rich harmonies of Hap and his sister Penny are accompanied by the sounds of acoustic guitar, piano, string quartet, woodwind ensemble, mandolin, dobro, fiddle and accordion. Children also learn about the music of many cultures by hearing the sounds of instruments from around the world: from China, the bamboo flute and gu-jen (Chinese harp); from Spain the Spanish guitar; from France the celesta; and from Nigeria the shekere, kannago and dundun. Native American instruments include the Chippewa flute, North American council drum, tarahuamara drum, chicahuasti and Yaqui dance belt. Children will be fascinated by this mixture of sounds and rhythms which provides a peaceful transition between play time and quit time. How many stars are up in the sky? How many grains of sand on the shore? How many fish swim down in the sea? How many blades of grass in the field? How many birds fly up in the air? How many shells on the ocean floor? How many berries hang on the vine? How many seeds does the spring breeze sow? How many leaves are up in the tree? What do you see, my love? Beside your bright blue ball? What do you see, my baby? To catch a flying bug? Vendrán angelitos las sombras de noche. Alumbran mi niño que está en la cuna. Note: in this lullaby from El Salvador, the word "dormite"
is traditionally used instead of the word "duermete"
Hap Palmer, educator and singer/songwriter, is an innovator in the use of music and movement to teach basic skills and encourage the use of imagination and creativity. He has been referred to by Parents' Choice as the dean of children's music. For over twenty years his recordings have been widely used in schools and day care centers. A songwriter, musician, singer, dancer and educator, he conducts workshops and presents concerts throughout the nation. He has taught courses for various education extension programs, participated in volunteer programs for the Los Angeles Unified School District and directed classes in creative movement for children, physical fitness, and tap dance. He has also performed with the UCLA Dance Company, and the Pierce College Dance Theater. His educational background includes an M.A. in Dance Education from the University of California at Los Angeles. His recordings and videos have received numerous honors including the Parents' Choice Award, the American Library Association Notable Recording designation, the American Library Association Best of the Best for Children, the National Parenting Publications Award, the Early Childhood News Directors Choice Award, and the American Video Award. Produced by: Hap Palmer, Miriam Mayer Arranged by: Miriam Mayer Vocals: Hap Palmer, Penny Palmer Vocal Arrangements: Hap Palmer Engineer: John Slattery Recording Consultant: Tom Perry Piano: Steve Kaplan Acoustic, Classical and Electric Guitars: Grant Geisman Spanish Guitar: Steve Carnelli Acoustic Guitar: Hap Palmer Bass, Acoustic Bass: Jim Garafalo Drums: Tom Walsh Violins: Peter Kent, Robin Lorrentz Viola: Tom Tally Cello: Matt Cooker Fiddle: Miriam Mayer Nigerian Percussion: Francis Awe Chippewa Flute, Native American Percussion: Guillermo Martinez Accordion, Celeste, Piano: Doug Legacy Gu-Jen: Hui Zhao Flute, Bamboo Flute: Suzanne Teng Flute, Oboe, Clarinet: Jon Kip Spanish Consultants: Oscar Contraras, Raphael Juarez Designed and Illustrated by: Carol Schumacher Onaitis Guide Editor: Paula Benjamin Little All Songs © 1993 Hap-Pal Music, Inc.
Amazing Lullabies! This is my favorite CD to play at naptime! At first I was a little skeptical about this CD, but after listening to it I was sure I loved it! So many albums have all the same songs, but this one incorporates many different cultures and sounds into it that it keeps me interested and the children soothed, all while giving us a taste of other cultures! The best lullaby CD money can buy! We received the cassette tape version of this CD at granddaughter's first birthday and have loved it for the past 3 1/2 years! We wore the tape out and ordered the CD to listen to each night at bedtime! I would recommend it to all ages - young and old!